Wolves are the largest and the most distributed canids in India. However, they have not captured public imagination in the same way as other mega fauna of the country. One reason is that wolves have been extirpated from much of their historical range and their encounters with humans have become less common. Another reason is that their charisma pales in the front of current flagship species, leaving wolves in the shadow of the feline carnivores. Conservation philosophy in India has become predominantly forest-oriented. The recent draft of the National Forest Policy also reflects the same psyche. Grasslands and deserts are often considered wastelands and species there find it difficult to attain the status of flagship species. For starters, we have two types of wolves in India. The Indian Wolf or Peninsular Wolf is the most familiar one, distributed in a few remaining grasslands of central and southern India. The Indian wolf is recognised as a distinct subspecies of the Grey Wolf—as Canis lupus pallipes. Another lesser-known lineage of wolves is found beyond the heights of the Himalayas. 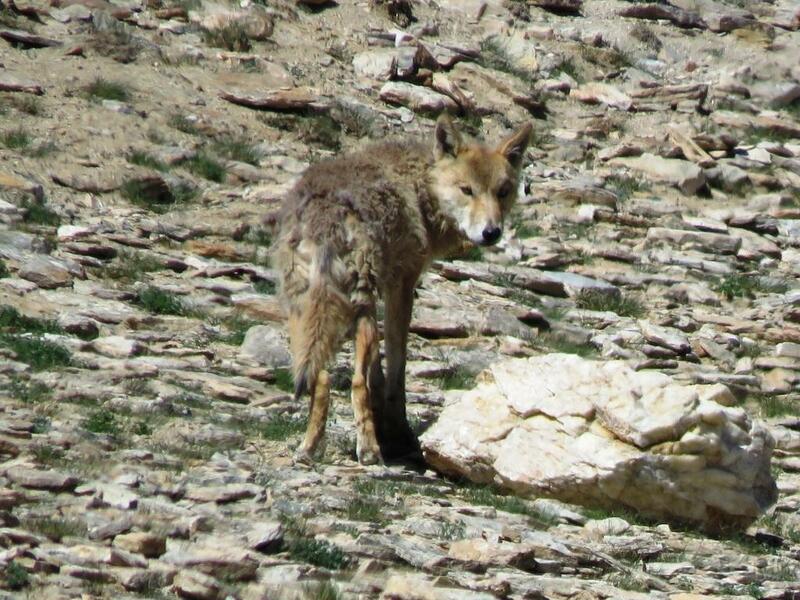 As one would expect, wolves in the Himalayas show clear distinction from the peninsular ones. Environmental factors and geographical barriers barring intermingling of both the wolves would originate such differences. The Indian wolf is one of the smallest (weighing on an average 25 kg) and shortest in height, very lean and slender in appearance, and has a slim black tipped tail and brown-grey shades of coat. Wolves in the Himalayas, on other hand, are larger (weighing about 35 kg), with a broader skull, longer muzzle and more whitish coat. A bushy tail, thick fur and a longer crest of black hairs on the shoulders also give them the name of Woolly Wolf. In India, these wolves are spread across the Trans-Himalayas along the borders with Tibet (China). The best place to sight these wolves is Ladakh and Spiti. Their presence is reported from Uttarakhand, Nepal, Sikkim and Arunachal Pradesh as well. Wolves in the Himalayas have generated great interest in the scientific community for their unique evolutionary history and uncertain taxonomic status. Although they were first described by British naturalist Brian Houghton Hodgson in 1847, a consensus on their nomenclature is yet to be reached. These wolves kept themselves hidden in the high-altitude valleys, dodging the attention of scientists and explorers for long. Genetics studies from 2003 to 2007 discovered new findings about these wolves bringing them into spotlight. Grey wolves are considered to have originated about 800,000 years ago. This is the same time when the Himalayas were rising. Scientists suspected that these wolves were trapped in the Himalayas and evolved separately since then. The grey wolves in rest of the world evolved into different subspecies including the domestic dog, making them a separate “clade”. Clade is a term used by biologists to describe organisms believed to have common ancestors. Wolves in the Himalayas didn't participate in a common history of the grey wolf lineages and dogs. Scientists argued that these wolves should be recognized as a separate species—Canis himalayensis, popularly called the Himalayan Wolf and locally known as Changku. This claim, however, opened a debate in the scientific community. Ecological species concept is based on breeding isolation, meaning that two populations can be termed species only if they don't interbreed. Some suggest that the divergence is not as big to call them separate species but a separate wolf subspecies—Canis lupus himalayensis. Wolf history is a complex affair and the ability of wolf subspecies to interbreed has challenged scientists. The comparatively recent expansion of the grey wolf in eastern Asia brought further complexities where older lineages mixed with the newer ones. The Tibetan Wolf (Canis lupus chanco) in the north and the grey wolf (Canis lupus campestris) in the west as close as the Gilgit-Baltistan region of Jammu and Kashmir blurred the lines for the Himalayan wolf. A University of Oxford researcher, Geraldine Werhahn, recently reported the genetic markers of Himalayan wolves from as north as Qinghai Lake in China. Although their ancient origin is established, the geographic extant of the Himalayan wolf is not well-defined and understanding their genetic separation requires further studies. My colleague and friend, Lauren Hennelly conducted a study on the howling structure of the Himalayan wolves and compared it to wolves from other parts of the world. She found that unlike other wolves, Himalayan wolf howls are of short duration and have un-modulated frequencies, which means that sound frequencies do not change much during a Himalayan wolf howl. The mean frequency of the Himalayan wolf howl is much lower than that of other wolves, allowing them to communicate over long distances in a habitat known for its speedy wind. Howl structure study yet again emphasised on a different evolutionary history of the Himalayan wolf. Although a precise and robust estimate of the Himalayan wolf is unavailable, a study in 1995 concluded that there could be a population of 350 such wolves left in the wild. A team of scientists at the Wildlife Institute of India, Dehradun, where I work, has been studying these wolves in the Indian part of the Himalayas. We found that Himalayan wolves have huge movement ranges covering about 2000 sq. km area. Compared to this, Indian wolves are known to have home ranges of 150-200 sq. km. Our study on modeling their distribution exhibits that wolves have quite limited suitable habitat. Explorations on their movement and distribution ecology leave us with a rough estimate of 70-90 wolf packs functioning in the Indian trans-Himalayan landscape. The precarious status of the Himalayan wolf population keeps them constantly under risk. 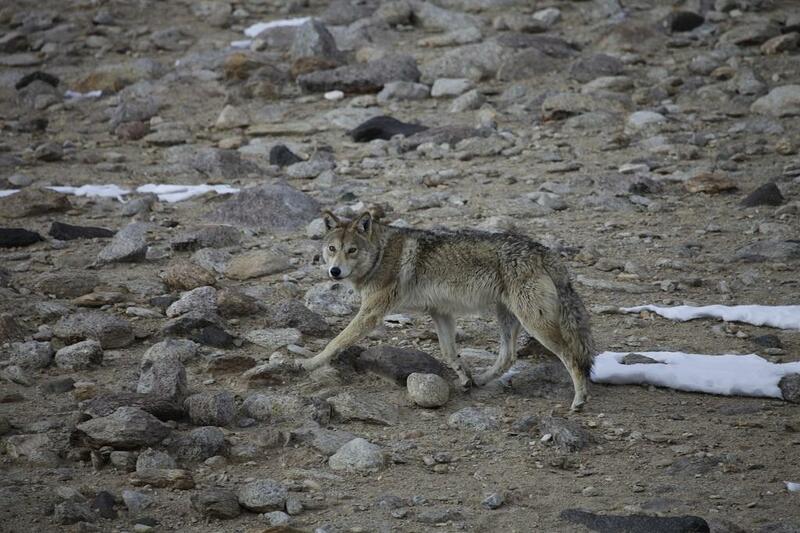 Our research shows that Himalayan wolves acquire a major portion of their diet from livestock. In a landscape where wild prey is rare and pastoralism is a widespread practice, perhaps a livestock diet is only survival strategy. But it comes at the cost of retaliatory persecution, which is the biggest challenge for wolf conservation. The Himalayan wolf is mainly concentrated in the valleys and shares its habitat with humans. Rapid habitat modifications, development of human infrastructures and alteration of grasslands are other threats. Another recent danger that is threatening the future of this unique lineage is the increasing number stray/feral dogs in the landscape. Not only are they overtaking wolf territories in direct competition, hybridisation could potentially change the genetics and unique adaptations that Himalayan wolves have developed. The National Red List of Nepal has recently listed them as Critically Endangered. However, the taxonomic debate keeps them internationally unrecognised. The Himalayan wolf holds a unique status in the rich natural heritage of India. Taking a cue from Nepal’s decision, we must also move in the direction of providing them right recognition and conservation.